To fit a small pot; larger size in brackets. 8 ply yarn and a 4mm crochet hook. 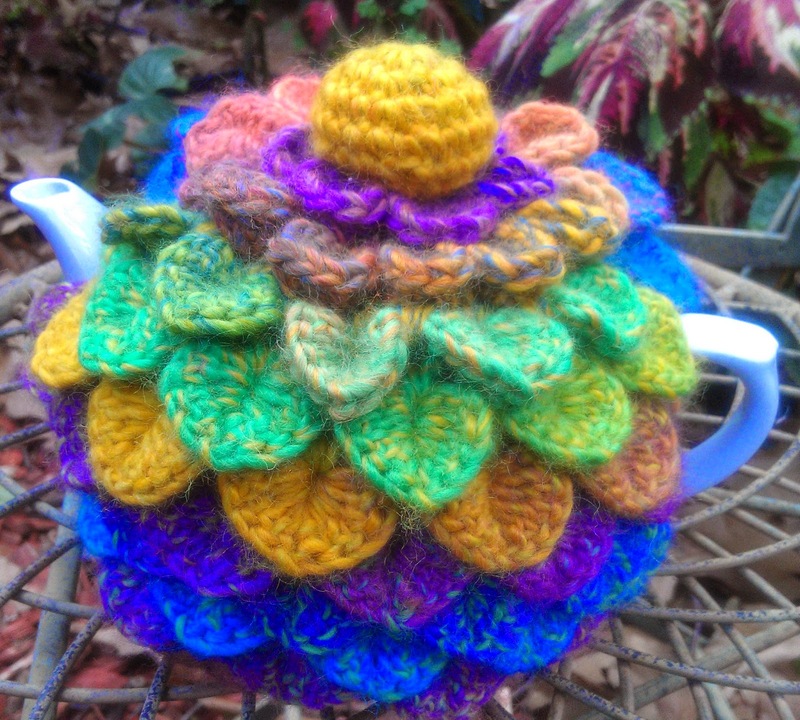 This tea cosy uses approximately 60g -80g of yarn. Start with 29 chain for a small tea cosy; (35 chain to fit a medium sized pot). Row 1. Work 1 treble in the 5th chain from the hook, *miss 2 chain. In the next stitch, work 1 tr, 1 ch, 1 tr. * Repeat from * to * to the end of the row. Note that there are now 9 (11) V-shapes. Turn the work. Repeat from * to * to the end of the row. 5 (6) scales. Row 3. 3 chain; work a V-stitch (1 tr, 1 ch, 1 tr) in each of the 1chain spaces of the first row. Catch the join between the scales when you work every second V-stitch; finish with 1 tr into the third of the 3 ch that was worked at the beginning of row 2. Turn. Row 4. Slip stitch into the first 2 treble and into the 1 ch space of the first V-stitch. *Into the next V-stitch, work 5 tr, 1 ch, 5 tr. Miss the next V-stitch. * Repeat from * to * until 1 V-stitch remains. Slip stitch into the 1 ch space and into the last 2 treble. Turn. Row 5. As for row 3, except that the last treble will be worked over the treble of the previous row. Row 6. 1 ch, 5 tr down post of first V-stitch, 1 ch, 5 tr up other side of V-stitch. Miss 1 V stitch. Repeat to the end of the row. Repeat rows 3- 6 until 8 (9) rows of scales have been worked. 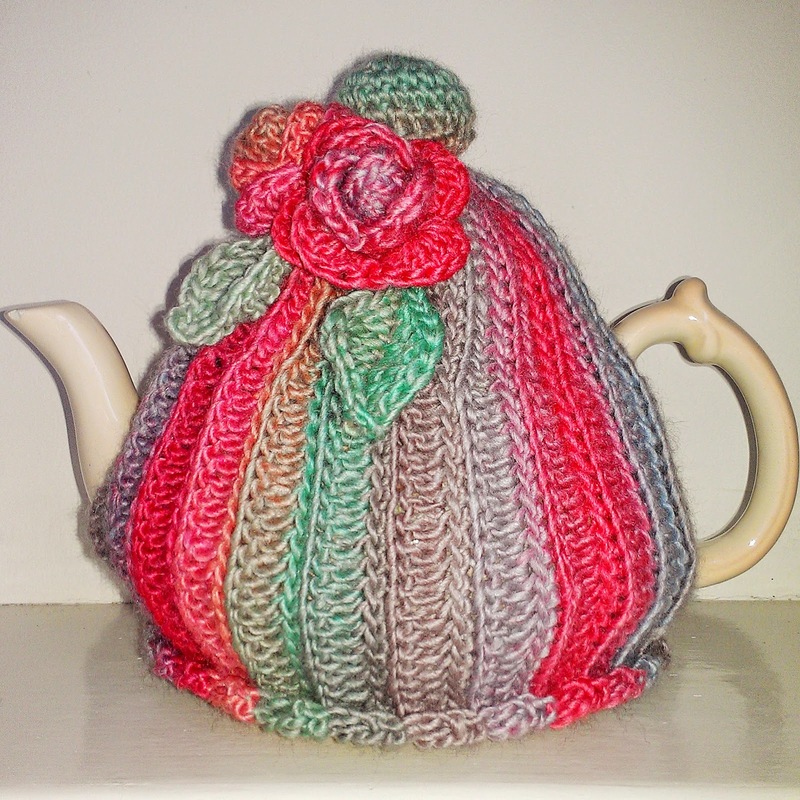 Note that the tea cosy at the top of the page has been worked in a variegated yarn. the example here has been worked in stripes, changing yarn colour on each V-stitch row. Stitch together the sides for about 2 cm from the base up, and down about 3 cm from the top. Try it on your pot to make sure the openings are large enough. Round 1.Join yarn in between any 2 scales, and with the right side facing, work a round of 10 (12) V-stitches, ( working only in the space between scales, and skipping the 1 ch spaces in the centre of the scales). Join with a slip stitch; then work 1 slip stitch into the first 1 ch space. Round 2. Work 5 (6) scales, skipping every second V stitch as before, join with a ss. Try it on your pot; all pots are different. Some pots may need another one or two rows of scales for a nice fit. Start with 4 chain, 1 treble into the same 1 chain space, V stitch into centre of next scale, V stitch into join between next 2 scales; continue to the end of the round and slip stitch into the 3rd of the 4 chain. Slip stitch along to the next 1 chain space, into next 2 trebles, and into the 1 chain space of the second V stitch. Work the scales as before. Cut the yarn leaving a 20 cm tail. Thread onto a needle, and gather the top edge of the work. Pull to leave a 2-3 cm hole, fasten off yarn securely. The hole at the top allows the knob of the tea pot to peep through. Alternatively, pull the yarn tightly to close the hole as much as possible. Secure the ends. Make a knob and sew it onto the top of the cosy. 4 chain, join with a slip stitch to form a ring. 10 double crochet into the ring, slip stitch into the first double crochet. Work 5 round of double crochet in all. Fasten off. Thread the yarn tail into a needle, and gather around the open edge. Stuff with a little fibre fill, pull the gathering thread tight and fasten off. This will form a neat round shape. Start at the top of the knob. With the 4 mm hook, make 4 chain; slip stitch into the first chain to form a ring. 1 chain, 10 dc into the ring; ss into first dc. I work these stitches over the tail of the yarn as well as the chain stitches, then the tail can be pulled tight to close the hole. This is stronger than working into a ring of thread alone. You still need to anchor the tail so it doesn't work loose. Next round, 1 chain, 1 dc into same place as the ss, (2 dc into next dc, 1 dc into next dc) repeat to the end of the round, ss into first dc of the round. 15 stitches. Work 1 more round of 20 dc. Next round, decrease to 15 dc, by working a dc over each dc of previous row, missing every fourth stitch. Next round, decrease to 10 stitches as above, but missing every third stitch. Pull the thread to close the top of the knob and secure. Stuff the knob with a little fibre fill, or use yarn offcuts in the same colour. Thread a needle and work a running stitch around the bottom of the knob, pull tight to close, secure, and stitch to the top of the cosy. This one is for people who crochet....no knitted bits in here! The base of the work naturally curls up, giving it a soft look. The instructions are given in Australian; I noticed that there's a translation button on Justjen's blog (see my links to free patterns tab) for USA crocheters, who use the same terms, but assign different meanings. Australian and European terminology are the same. Not sure about Canada. Tea cosy is in 8 ply yarn; 4 mm crochet hook for the body of the cosy, 3.5 hook for leaves and flowers. This yarn comes from Big W; it's a Sean Sheep yarn called 'Rockbank'. Cheap, and nice too! The instructions are for a large tea cosy, a six cupper! Work a row of dc, starting with the second chain from the hook. (35 stitches). 1 ch, turn. Working into the front loop of each stitch, dc all along the row. Continue with these two rows until the work measures 24 cm, ending with a dc row. Work the opening for the spout. 8 treble (the 3 turning chain counts as the first treble); 15 chain; miss the next 15 stitches, 2 half treble, 5 double crochet, 5 slip stitches. (35, stitches). Continue working the same 2 rows until the sides are the same size, ending with a dc row, then work the row above for the spout/handle opening. Break off yarn, and sew the side seam (ie, join the foundation chain to the last row worked. With a needle and thread, run a gathering stitch around the top opening, and draw in and secure, leaving an opening of about 2 cm diameter. Make the knob and sew it over the opening. Use 8 ply yarn and a 3.5mm hook. Work into one loop only of each chain stitch. Miss the first chain and slip stitch in each of the next 5 stitches, 1dc in next st, 1htr in next st, 1 tr in next st, 1dtr in each of next 3 stitches, 1 tr in next st, 1 htr in next st, 1 dc in last of the chain stitches. Now work down the other side of the foundation chain with the same sequence of stitches. Finish with a slip stitch into the stem of the leaf. Make 26 chain. Miss the first chain, and work 1 dc into each of the next 25 chain. Turn. Don't work any turning chain. Miss 2 sts, 6 tr in next st, miss 2 sts, ss in next st. Repeat this sequence to the end of the row; this will produce 8 shells. 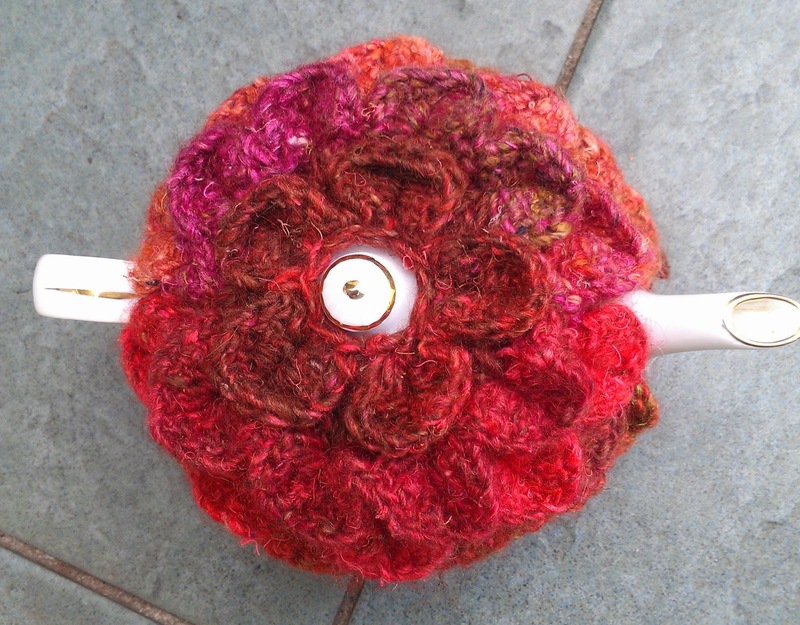 Fasten off the yarn, leaving long tails for sewing the flower on to the tea cosy. Roll up the strip; keep the base flat, and secure the lower edges in place with one of the yarn tails. 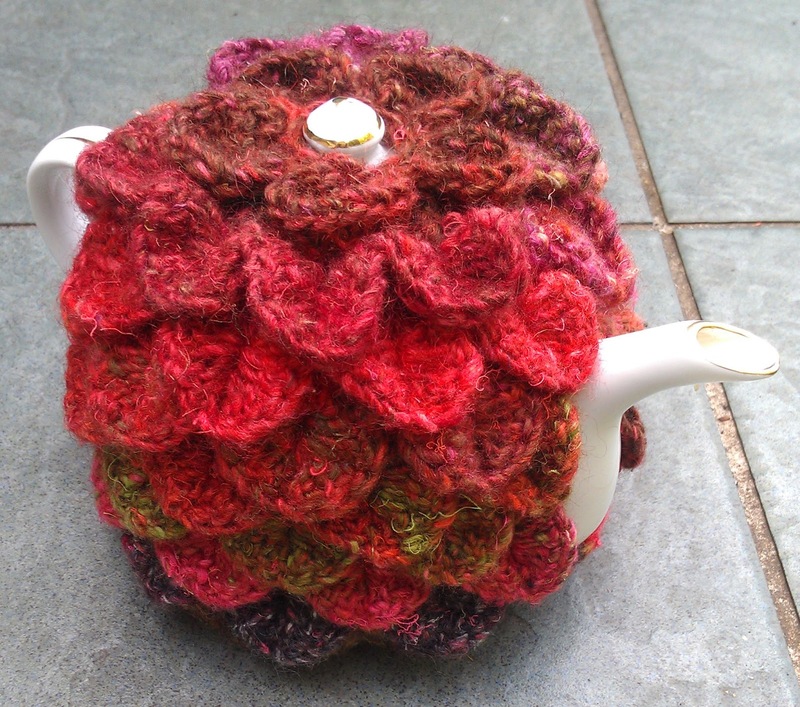 Sew a leaf on to the flower base, and then sew on to the tea cosy. With the 3.5mm hook, make 4 chain; slip stitch into the first chain to form a ring. Work 2 more rounds of 20 dc. Next round, decrease to 15 dc, by missing every fourth stitch. Next round, decrease to 10 stitches by missing every third stitch. I'm so sorry for your loss. Truly sorry. It's a terrible one. My daughter died five days before her 52nd birthday in 2016 of colon cancer. Currently I'm knitting short fingered gloves for patients, her friends on the ward admired hers, as her last request was for me to do this.. But, I will be happy to join your tea cozy knitting cause as well.